Small, lightweight, and multi-purpose items are sure to find their way into my every day carry survival kit. And few things are smaller, weigh less, and are as varied in their uses as standard safety pins. Often when we think of uses for safety pins, the idea of temporarily repair garments comes to mind and with good reason. Safety pins are tools of the trade for tailors and seamstresses. Quilt makers use them to hold layers of batting and fabrics together. Safety pins, it seems, were designed to hold clothing and fabrics together. In the wilderness, we can likewise use safety pins in much the same way. We can temporarily repair ripped or damaged clothing and gear using safety pins. Limb rip your backpack? Hold it together with a safety pin. Lose a clasp on a strap? A safety pin will due until you can get to the store. Lost a zipper pull? A safety pin makes a good substitute. The uses for safety pins are practically limitless. Survival kits often include a small amount of fishing tackle including monofilament line, lead sinkers, and barbed hooks that can be used to fish for food during survival situations. Small, easily caught panfish such as bream or bluegill can be a wonderful source of nourishment and can really boost morale when surviving near a water source. Even if you don’t have sufficient fishing tackle, you can fashion some primitive gear using the inner strands of 550 paracord and a safety pin for a hook. It may not fool the trophy bass or walleye, but it certainly can help put an indiscriminate panfish on the skewer and some much needed calories in your stomach. 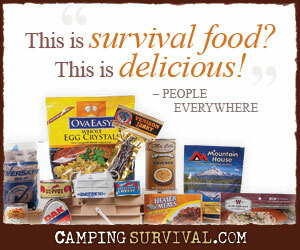 Unfortunately, many people thrust into wilderness survival scenarios must make do under less than ideal circumstances. Perhaps the event that landed them in a survival situation, such as a wrecked mountain bike or snowmobile, left them in an injured state. Or maybe in the rush to find the trail that must be just around the next bend, their footing is lost and they take a tumble down the side of a steep hill. Whatever the cause, an injury has been incurred and survival has just been made that much more difficult. A safety pin has a number of uses in first aid. It can be used to immobilize an arm by pinning the cuff of a long sleeve shirt to its chest to fashion a makeshift arm sling. Safety pins can be used to secure a bandana over a wounded and bleeding arm or leg. They can even be used to help keep a severe wound closed in place of stitches in dire circumstances. And I’ve removed more than one splinter in the wilderness using a trusty safety pin. In my kit, safety pins are well worth their weight and the space they take up. What other uses have you found for safety pins? A large safety pin, opened and straightened can be very effective in wounding someone who is a threat if you have no other chances of defending yourself. The surprise and pain might give a person an opening for better defense tactics. Maybe it is a silly girly thing, but keep a safety pin attached/pinned to your clothing in a concealed place–inside a shirt cuff, inside the buttoned area of your shirt, at the top inside of your sock,etc. Another good use for safety pins; thanks Practical Parsimony. Don’t forget about the safety pin’s big brother – the blanket pin. You can find these on line, and I’ve seen them at Tractor Supply. A few of them can turn an ordinary blanket into a decent sleeping bag.